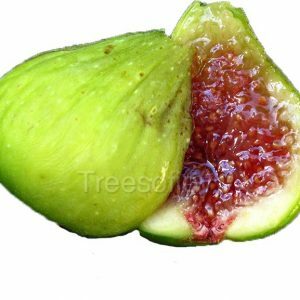 Many researchers claim that the Middle East is the origin of Ficus Carica the common fig. Archeologists have discovered remains of fig trees in cultivation in Jordan valley tracing back to 4000 BC. 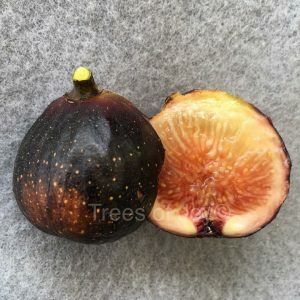 There are hundreds of varieties in that region that deserves a lot of attention; the local agricultural departments have paid little attention to evaluate the different types of figs from that area. 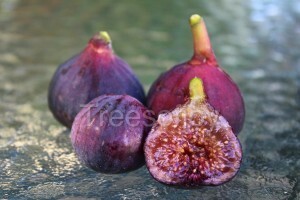 Fig is considered to be one the oldest fruit trees in the Mediterranean zone. 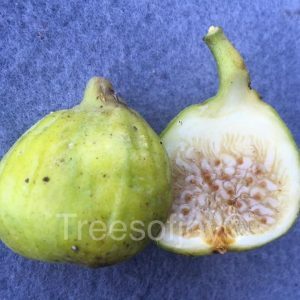 A famous fig breeder and researcher named Ira Condit mentioned that Syria and Anatolia are the natural habitats of the fig tree and from there it was transferred to North Africa, Spain, Mexico, Chile, Peru and California (Mueot laal ., 1960). It was also transported to South America via France and to Mesopotamia, Iran and India from Anatolia (Condit, 1947; Condit, 1955). Many of the varieties of the Middle East were given descriptive names based on the shape, color or flavor. For example the variety named Byadi which comes from the word Abyad for white, it can be found in different areas of Lebanon, Syria and Jordan and many varieties were given that name although they’re not genetically the same. Living in the USA it’s hard to collect all these varieties and evaluate them; however I have collected many varieties from the Middle East that originally made it to this country with immigrants years ago. Especially Syria, Lebanon, and some other mid eastern countries like Jordan, Palestine/Israel, Egypt. My Main focus is the Syrian and Lebanese varieties, due to the lack of attention given by these countries to evaluate and have selected known varieties. Jordan: ‘Khudeiri’, ‘Baiady’, ‘Safari’, ‘Nehemiy’, ‘Sbai’, ‘Kharroubi’, ‘Malktenia’. Egypt: Barshoumi, ‘Kahramany’, ‘Aboudi’, ‘Assouany’, ‘Koummassi’, ‘Adassi’, ‘Abiad’, ‘Sultani’, “Hava”. Tunisia: ‘Thamar¡’, ‘Deri’, ‘Black Birchi’,”Zidi”. ‘Fassi’, ‘Aboucherchaou’, ‘Hafer el Baeol’, ‘Sebi’, and other cultivars. Syria: Green yellow varieties: ‘Khudeiri’, ‘Sultani’, ‘Khani’, ‘Halabi’, ‘Sefraouli’, ‘Esseli’, ‘Anzuki’, ‘Boukrati’, Birtati, Sumacki, Shtawi, “Asfar”, Shami. – Brown-red varieties: ‘Zeibily-Sammaki’, ‘Afani’, ‘Shincheri’. Lebanon: Shtawi, Souadi, Boukrati, Bouadi, and several others. Some of these varieties may require pollination to set fruit crop. 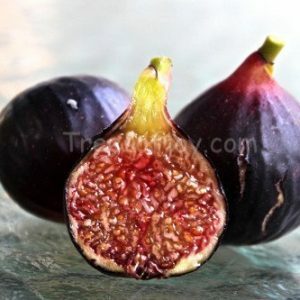 Pollinating these figs can only be done by a special fig wasp. I will be releasing some of the Mid eastern varieties to the public once I know they are successful in our area. 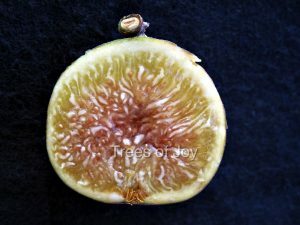 Here’s some photos and info on some of the varieties I have that fruited. 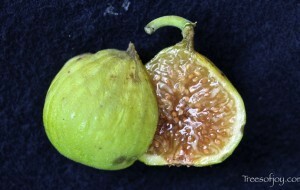 Byadi: Excellent tasty fig with light green skin, comes from the village of Mishtayeh in Syria. It has been grown in Bethlehem, pa for several years and produces a decent crop. The tree develops a strong straight trunk, suitable for training as a standard. Lebanese Red: Excellent tasting fig, produces two heavy crops a year. Has been grown in the ground in Pennsylvania and did well. Behaves well in the rainy condition and doesn’t split. Shtawi: This is a variety grown in Koura, Lebanon. Shtawi comes from the word Shitaa’ in Arabic which means winter. It ripens very late, usually in November into Christmas. Not suitable to grow in cool summers, and areas with cold winter unless grown in greenhouse. Very good taste and very productive. Sweet Joy /Syrian 6: a numbered variety from a collection of unknown figs from Syria. This tree is vigorous and productive. The unique skin color and the interior is excellent tasting. Syrian #3: A unique color and good flavor. The skin starts out bronze colored, then as it ripens it gets a blush of red, the pulp is yellow. Souadi: This particular variety came from a village in the hills near Byblos. 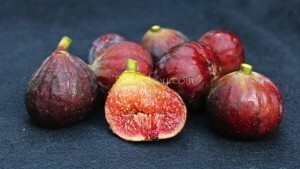 The medium figs are so sweet and the tree is productive. The skin changes from red to black. I’m glad you got plants from the Middle East. let me know how they do for you. and thanks for your order. Hello BASS. 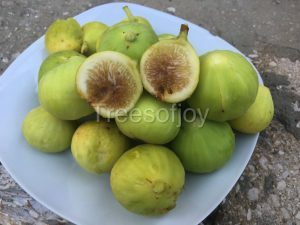 what can you tell me about Lebanese yellow fig? I have one that is two years old and has not fruited yet. 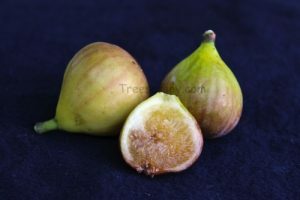 hello, I don’t have this variety, I know there was an unknown fig that was introduced as yellow Lebanese, I don’t have experience with. it myself.